With every passing year, the U.S. is pummeled with stronger and stronger natural disasters, from category 5 hurricanes to increasingly intense wildfires. Turning on the television at any point last Fall felt like the apocalypse had come and was slowly taking down one city at a time in the form of violent natural disasters. While storms and their immediate drama make headlines, it’s the cleanup and recovery that takes time, long after reporters and news crews have packed up and returned home. The longest-term impact of recovery from natural disaster, however, is water management. Many weather events affect public water, regardless of what element that disaster involves. It’s easy to take U.S. drinking water for granted. The way it flows out of our taps could easily lull anyone into thinking clean water is abundant and plentiful. But getting clean water into our homes requires a complex, interconnected system that’s vulnerable to the many and increasing natural disasters we face each year. Simply put, if something goes wrong with any one of the steps in the water treatment and delivery process, it can affect your water’s safety. Post-disaster news coming out of Puerto Rico demonstrated just how fragile our clean water systems are, and how difficult emergency and recovery efforts are without them. Each subsequent natural disaster the country experiences puts a greater strain not only on the water supply, but also the system that transports that water to citizens safely. Treatment plants can get overwhelmed and infrastructure pipes may get blockages, which are big concerns as global warming promises to make natural disasters more severe and more frequent. And many of those disasters, according to the New England Journal of Medicine, will be storms and floods. Every type of natural disaster can result in a plethora of fun obstacles and consequences to delivering safe clean water to citizens. It’s like a tough mudder! (Only the race course is our lives, no one signed up for this, much less paid to participate, and no one gets a free t-shirt!) Disasters can bring water contamination, shifting ground and infrastructure, and unhealthy increases in minerals, metals, and other elements all within the water that every human being needs to survive. While it’s impossible to predict every way that natural disasters can impact our water — hey, thanks storms and floods, for being your unpredictable selves! — there are at least some common results, and as G.I. Joe once said: knowing is half the battle. Contamination is perhaps the most prevalent and complex effect that arises – both in the immediate and long-term shadow of a disaster. Post disaster, debris from the wreckage of homes and other structures can travel long distances, gathering contaminants, and settling miles from where it started. As litter, wreckage, and rock sediment accumulate in surrounding water supplies, these new elements introduce substances that can throw off the balance of the water supply with damaging and even lethal consequences. What’s worse is that it’s even harder to track how far those contaminants can travel! After Hurricane Harvey, one alarming find was mercury in the water of a riverfront property in Channelview, Texas. As a representative from the Texas Health and Environment Alliance commented, “We have no idea where these floodwaters could have carried these contaminants…” Wreckage and pollutants can surely travel far enough to require a passport and probably do more international travel that most of us could ever hope to do ourselves. In addition to debris and wreckage that get washed into the supply, our treatment plants get inundated in extreme rain events. The plants are built to only handle so much volume at once, and they don’t possess capacity to handle all the excess precipitation during something like a hurricane. As Bloomberg BNA reported after Hurricane Harvey, “…wastewater plants are designed with a bypass that allows water to flow directly through them during big storms that overwhelm their capacity. However, this means that untreated raw sewage will be flowing directly into Texas’ waterways, which eventually deposit into the Gulf of Mexico.” The Gulf of Mexico, of course, extends far beyond the Texas coast and even crosses international boundaries. The functioning of our treatment systems is predicated on them not suffering under a disaster’s effects, so when they’re also subject to overflow or inundation, it’s almost as if they don’t exist at all. It isn’t just treatment plants that can allow unwanted elements into the water, runoff from agriculture does as well, thanks to that old buddy, erosion. In rural areas, everything from grazing to tilling to irrigation push unsavory elements into the water system. Keep in mind that most farms use pesticides and fertilizers that flow into fresh water. Farming pollutants may include herbicides, heavy metals, salts, and nutrients such as nitrogen and phosphorus. Sure, those are normalized elements of farming, one’s agricultural societies have faced for decades. But there’s enough farmland in the U.S. for that runoff to do significant damage. For some comparison, a study from the EPA, stated that agricultural “…pollution is the leading source of water quality impacts on surveyed rivers and streams, the third largest source for lakes, [and] the second largest source of impairments to wetlands…” Yeah. That’s definitely not something anyone can afford to ignore. Treatment plants need electricity to operate, and unfortunately, this makes them vulnerable to power outages. Even a short electrical outage can result in stagnant or under-treated water. In the aftermath of Hurricane Harvey, AWWA also noted that, “Even if [utility-owned] facilities aren’t inundated…they may not have the power needed to run their pumps or an ability to get fuel for their generators.” It’s not especially comforting to know that if our electricity goes down, our water treatment can go right with it. The last step in any water treatment process is chemical disinfection. Unfortunately, though, treatment plants don’t always remove 100 percent of contaminants. Mother Nature Network recently reported, “Most contaminants are filtered out or killed with disinfectants, but… there are ways for enterprising microbes and chemicals to either sneak through or bypass the facilities altogether.” Two examples – albeit not a result of natural disasters – occurred in 2014. In West Virginia, 7500 gallons of the chemical MCHM — which is used to “clean” coal — leaked into the Elk River, a tributary of the Kanawha River, which flows into the Ohio and then the Mississippi, arriving eventually in the Gulf of Mexico. That same year, 400,000 people in Toledo, Ohio found themselves without water when a toxic algae bloom in Lake Erie — which is where Toledo gets its water — released enough microcystin to make it unsafe. And in both cases, local water treatment facilities could not remove the contaminants. To further concerns, the disinfection process also must introduce additional compounds in order to clean the water. Most water treatment facilities use some combination of chlorine and chloramines to remove other contaminants, but are in themselves chemical contaminants. Yeah, how’s that for a brain-bender? As the great Bugs Bunny has almost said, “That’s not all, folks!” Natural disasters can’t be prevented, but education about what to consider during and after they happen can start now. The more you know, the better! If a disaster has a direct effect on your home — say, it was flooded — there are certain actions with regard to your water that you definitely need to take. First, throw out any food that’s come into contact with floodwater. Sure, maybe you were saving that Ben ‘n’ Jerry’s for a special occasion, but if your freezer was flooded it’s time to say, “Boy, bye,” because it’s very likely those flood waters carried harmful bacteria into that Cherry Garcia. Besides, it’s probably soggy! In addition, sanitize any food prep item or surface that came into contact with flood water. Second, boil your water before use. 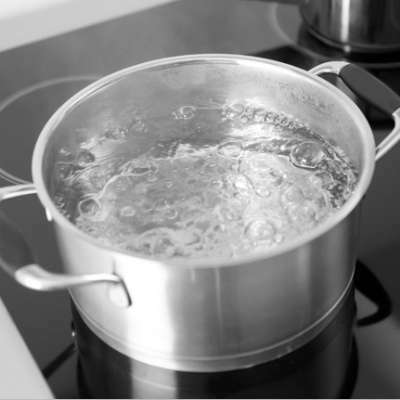 The Centers for disease control has detailed instructions for boiling and filtering your water on your own. One major thing folks can do in advance of a disaster is purchase water filtration systems for their homes, or even a tap water filter for their sinks. In a water crisis, the public often panics and clears grocery store shelves of all available bottled water. But many folks end up just hoarding those bottles and preventing those in more precarious situations (say, people with severe injuries or who have just lost their entire homes) from getting clean water they desperately need immediately following a disaster. But if your home is fortified with filtration as well as a UV light, you can filter out many of the contaminants on your own and even kill pathogens that may have gotten into your water. It might sound like an unnecessary precaution, but in the event of a historic storm, it’ll be a downright relief.